By Cptben, December 17, 2018 in Hello & See You! Hello there, my name is Cptben (account name) and as the title of this thread already said it all, I'm new to the game! I was looking for another anime MMORPG games to play other than SoulWorker, so I found this game on Steam but after seeing reviews about how the game is rather P2W to some, I decided to look up for a private server and here I am, hopefully this private server doesn't have too much P2W-fested. Anyway, I, hopefully, will see each of you in the game! The P2W in this server is pretty tame compared to officials imo. Almost everything you would spend money on (costumes, accessories, visual slots, enhancement materials, etc.) is craftable for free, either permanently or during time-limited events. Regardless, enjoy your stay! We're gonna be getting a new Christmas event soon so look forward to that! wait wait, how is the server P2W? I guess you could argue that it's P2W because VVIP (which costs money) is required if you want +15 and S-tunes on everything. Granted, none of that is strictly necessary and you could get by just fine with +12 and B-tunes. So instead of P2W I guess you could call it P2WM (pay to win more). On the other hand, if you want to top TCP leaderboards, you're definitely going to need to pay some big bucks. Again, it's not a necessity. But it is still a thing. Welcome to Code Closers!~ Enjoy your stay! how can VVIP give us +15 and s-tune? Having VVIP doesn't boost your success chance on enhancement. iirc VVIP only remove D tunes, you still can obtain S tunes even without VVIP tho. anyway, Welcome to CODE:Closers! If you have anything to ask, don't bother to ask! We would be glad to help you. Having VVIP doesn't boost your success chance on enhancement. The item's description says "higher enhancement chance" though, and correct me if I'm wrong but I assume means higher chance of success. 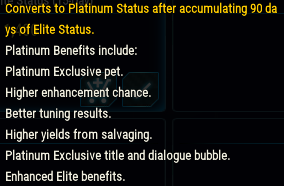 If VVIP doesn't actually provide this benefit, then I think the item's description should be changed ASAP. The item description says you get "higher enhancement chance" and "better tuning results". Whether or not it actually provides those benefits is kinda up for debate now. However, if VVIP does provide those benefits, then that's how it can give you +15 and S-tunes. Like N I C O said, you can still get S-tunes without VVIP. Same goes for +15. In that sense, you don't strictly need VVIP. But we all know how unforgiving this game's enhancement/tuning system is. Thus, anything that increases your chances of success is something you'll definitely want to have if you're trying to get +15 for full S-tunes. Hiya, Cptben && Welcome to the CODE: Closers Community! to your questions, feel free to make a post in our General Guides section on forums and we would be happy to help!